Yaba College of Technology, YABATECH Rector Engr. 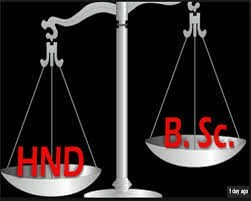 Obafemi Omokungbe Seeks Full Implementation and Removal of BS.c and HND Disparity Between University and Polytechnic Graduates. The Rector of Yaba college of Technology, Engr. Obafemi Omokungbe has appealed for the removal of the disparities between the university and polytechnic graduates in the Civil Service. He made this appeal while receiving a three - man delegations from the Office of the Head of Civil Service (OHCSF) and the National Board of Technical Education (NBTE) led by the Deputy Director, OHCSF, Mrs. Modupe Odubare, who were visiting the College as part of the benchmarking exercise for approval of the revised scheme of service and conditions of service for polytechnics and similar tertiary institutions.